The 13th annual Skate the Lake is scheduled for July 29. Last year's event raised over $18,000 for Boarding for Breast Cancer's preventrion and survivorship programs. Boarding for Breast Cancer returns to Lake Tahoe on Saturday, July 29, for the 13th annual Skate the Lake fundraiser, in order to raise money for the nonprofit’s cancer prevention and survivorship programs. 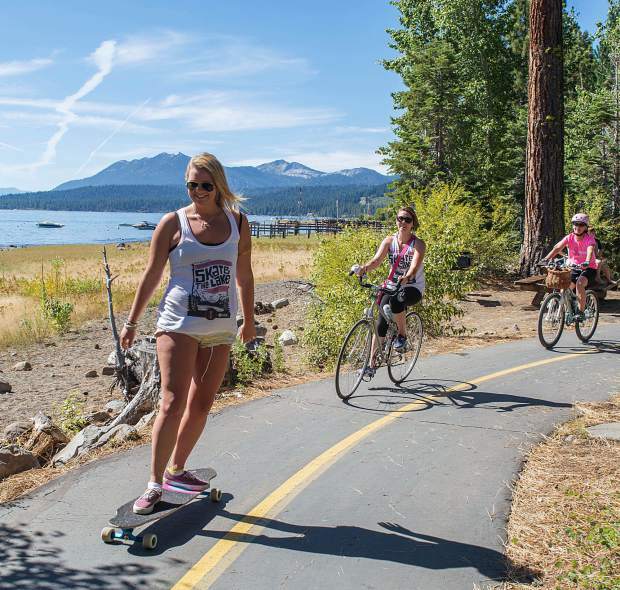 Participants will skate, bike, or roller skate along a 28-mile section of bike path in North Lake Tahoe as part of two days of festivities, which also include live music, raffles, and more. The event begins on Friday, July 28, with a kickoff registration party from 2 p.m. to 8 p.m. at Commons Beach in Tahoe City. Chuck Ragan, and DJ AUX / DJ IJV will be on hand playing music. There will also be a Pabst Blue Ribbon beer garden and barbecue, live painting, a silent auction, raffles, and a yoga session lead by Yoga Studio Tahoe at 4 p.m. The actual skate around Lake Tahoe will take place the following day at 7:30 a.m. at 64-Acres Park in Tahoe City, where participants will be shuttled to the start line at Ed Z’berg Sugar Pine Point State Park. From there riders will make their way over to Squaw Valley, and then onto the Truckee River Trail as they make their way toward the finish at Tahoe City. Skating will get underway at 8:30 a.m., and runs until 2 p.m. after which an awards ceremony for the top fundraisers will take place at Heritage Plaza in Tahoe City. Since its inception in 2005, Skate the Lake has raised over $260,000, according to a statement from Boarding for Breast Cancer. The nonprofit company started in 1996, according to its website, with the goal of raising breast cancer awareness. In 2016, Boarding for Breast Cancer helped put on nearly 50 events to raise charitable funds. In order to participate in this year’s Skate the Lake, a minimum of $50 must be raised. Participants raising that amount will receive a sponsor goodie bag, event T-shirt, and raffle tickets. There will also be prizes for raising more than $50 with tiers of award packages set at $100, $200, and $300. The top three fundraisers will be awarded prize packages from event partners, GoPro, Skullcandy, Arbor, Von Zipper, and Nixon. Those looking to hop on a board, bike or skates to participate in the event can raise cash by creating a personal fundraising campaign at give.classy.org/skatethelake. For people not looking to take on the 28-mile trek, there’s opportunity to sponsor someone else’s ride by donating on the website. As of Thursday, July 20, the event has raised over $5,600 of a stated goal of $30,000. Last year’s Skate the Lake raised over $18,000. All participants are required to wear helmets and sign waivers.